In this game, players each control a monster and the goal is to brawl with the other monsters in the game and win those duels in order to gain Victory Points. 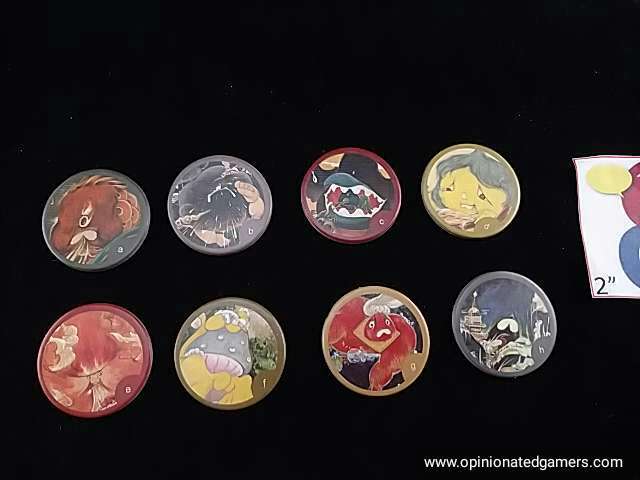 There are 8 different Monsters in the game, and each player chooses one to start. 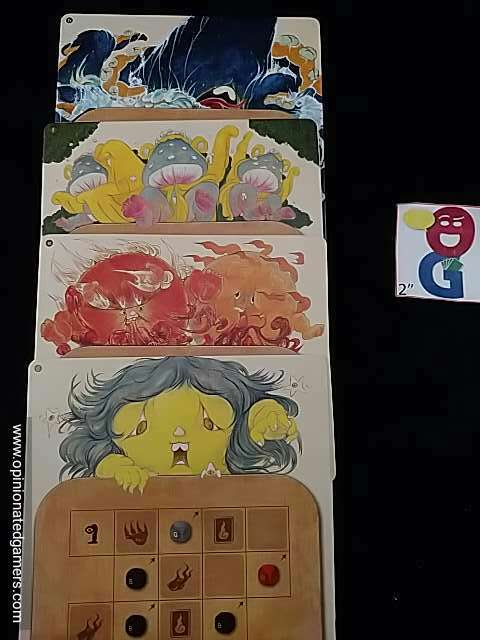 There is a special ability board for each monster as well as a puzzle like Monster Board to match. (Don’t worry -the components are bilingual, so just choose the side that you’re able to read!). There are matching illustrated player markers as well. Players will get some rune tokens (chosen from the special ability board) to start – these are placed on matching spaces on the main Monster board. The runes have a colored side and a used side – place them initially colored side up. Each player also gets one spell card to start. Spell cards have special actions on them, and each has a casting cost of Chi tokens to be used. If you choose to use a Spell card, discard the stated number of Chi tokens, do the action, and then discard the Spell card. 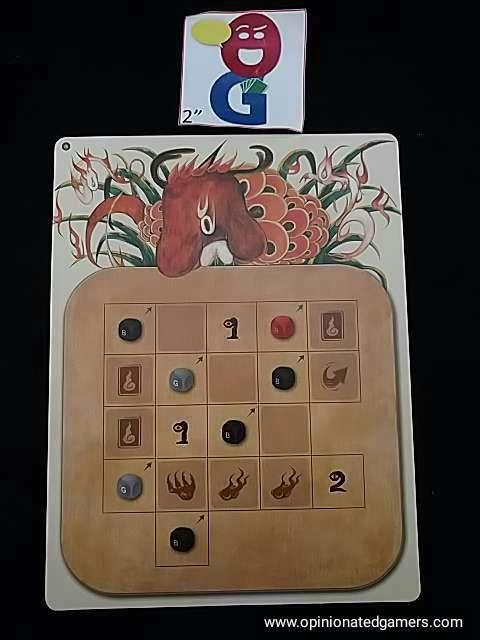 The game will be played over a number of rounds equal to the number of players – the start player card rotates so that each player will have one chance to go first. Each round follows the same pattern: Resource Phase, Challenge Phase, Cleanup Phase. In the Resource Phase, the start player deals out N+1 territory cards. These cards have some Runes and Chi symbols at the bottom. There is also a VP value on the card at the top. 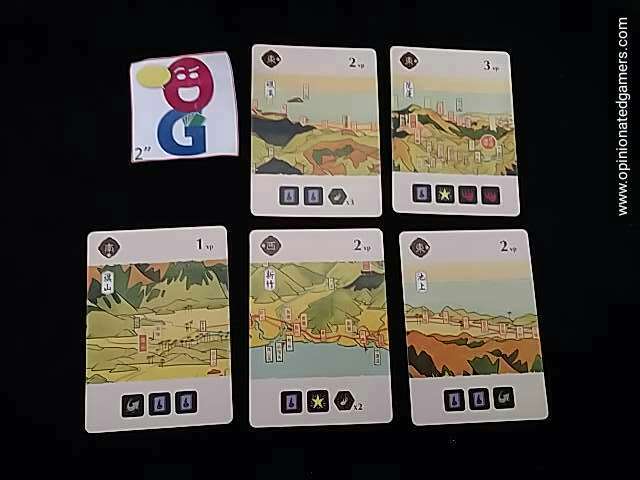 Starting with the starting player, each player puts their Player marker on an unclaimed Territory card and then takes the matching runes/Chi markers shown on that card. The runes are placed on matching spaces on that player’s Monster Board. Unused or unwanted runes can be traded in 1:1 for Chi tokens at this time. Once all players have chosen, the unchosen Territory card is discarded. In the Challenge Phase, players take turns to possibly Challenge other monsters. You can only challenge someone if your marker is currently on a Territory card (if you have previously lost a challenge this round, you’ll not be on a card…). So, let’s start with your options if you’re on a card: you can either Pass or Challenge another monster. If you pass, you take a rune of your choice and place it on your Monster board. If you Challenge someone, you designate your opponent. The Challenger goes thru 3 steps to figure out his attack value, and then the defender goes thru the same three steps to figure out his defense. Step 1: Take one of each of the three colored dice for your monster. Step 2: Optionally trigger a line on your Monster Board. During the game, you are adding runes to the board which is an irregular grid of spaces. Some spaces have rune icons which are filled with matching tokens. Other spaces might have “1”, “2”, or pictures of dice on them – these will not need to be filled in. A valid row on your board is one which has every rune space filled in, has at least 2 cells in it, has at least one colored-side-up rune in it, has no empty spaces in it, and must be horizontal or vertical. If you have one such line, you can trigger it. 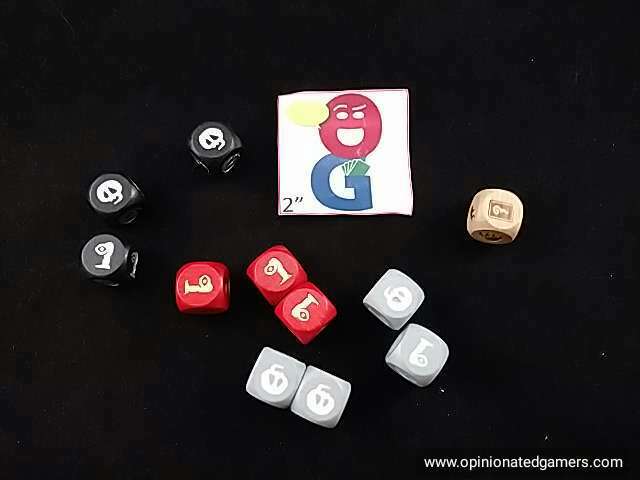 You automatically get points for any “1” or “2” in that row, and you add any pictured dice to your pool. The runes each have a special ability associated with them (upgrading dice, ability to re-roll dice, draw a Spell card). You take the appropriate matching abilities. Step 3: Then, roll all the dice that you have, and add up all your points. Then, flip over all the colored-side-up runes in that row. If you want, you might be able to play a Spell card here to further increase your score. The Defender now does the same thing, though he has the advantage of knowing what number he needs to beat. Once the Defender comes up with his number, they are compared. If the attacker wins, the Defender discards his territory card (and the attacker takes VP as shown on that card), and removes his player marker from the board. If the Defender wins, all markers stay on the board, but the Attacker moves his marker half-off the card to show that he is injured. An injured monster has a -1 point penalty to any further battles. If there is a tie, nothing happens cardwise. (Well, I’m assuming this – the rules actually don’t explicitly state what happens…) Finally, if the attacker won or tied, you check for a bonus. If the Defender was leading in VPs, the challenger gets a bonus equal to the difference in attack/defend values from this fight (up to 4VP). Phew. But what happens if you aren’t on a card? Well, you can’t challenge anyone. Instead, you can either choose to draw a Spell card or roll the special Rune Die and take the rolled tokens and place them onto your Monster board immediately. The rules don’t say whether you can trade in or not for Chi tokens as in the Resource phase. We played that you could do so. The Challenge phase goes until each player has had a chance to do something… Then, the game moves to the Cleanup phase. Here, any Monsters still on the table (and therefore still on territory cards) are scored, gaining points equal to the card they are still on – the territory cards are then discarded. All players then have a chance to flip over any/all used runes on their board for 3 Chi tokens each. All used-side-up runes are then discarded. The start player rotates and the next round is played. After the final round, the game ends. The player with the most points wins the game. Ties go to the player with the most colored runes on the Monster board. 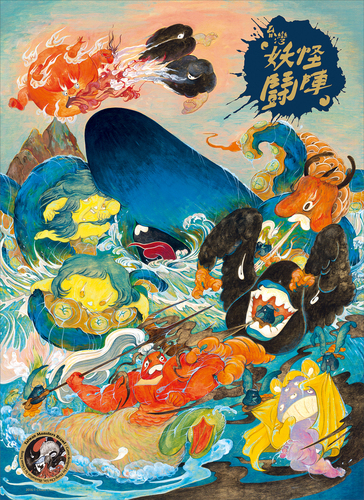 Taiwan Monsters Brawl (TWB) is a game that I ended up liking more than I thought that I would from reading the rules. Normally, I’m not a big fan of these brawling / battle royale games. First, it’s just not usually the style of game that I like to play. Second, I find that someone tends to get ganged up on – and ends up creating a bad game experience for at least that player. However, in TMB, I haven’t found that to be the case. First, there is a fairly decent strategy game hiding in the battling. The decision of which Territory card to take is more important than it looks – you might choose a card because of the runes that it gives you, but the high VP value of that card may end up putting a bullseye on your monster’s back… The bonus for taking the territory of the current leader tends to cause large VP swings (you often end up the leader once you beat the current leader), and this enticement often causes the targeting to shift. The Monster board is a nice puzzle. As you are placing runes, you have to choose between finishing short/quick rows and longer/more powerful rows. It’s good to try to pick runes to finish off multiple lines to give yourself flexibility. As you do not clear off your board until the end of the round, you might end up using two different rows on your board that use the same rune – though, of course, you can only use the rune effect on the first activation! Depending on how your Monster Board looks, you may be better off trying to score points by attacking someone or maybe passing on your turn to draw a few more runes to bolster your defensive abilities. If you go last in the round, that’s your best chance of doubling up on scoring… if you can survive any attacks, you essentially get a free attack on someone without any chance of losing your own territory. If you attack while going first, you certainly have the initiative in attacking, but your board will likely be depleted afterwards making any defensive efforts weak. 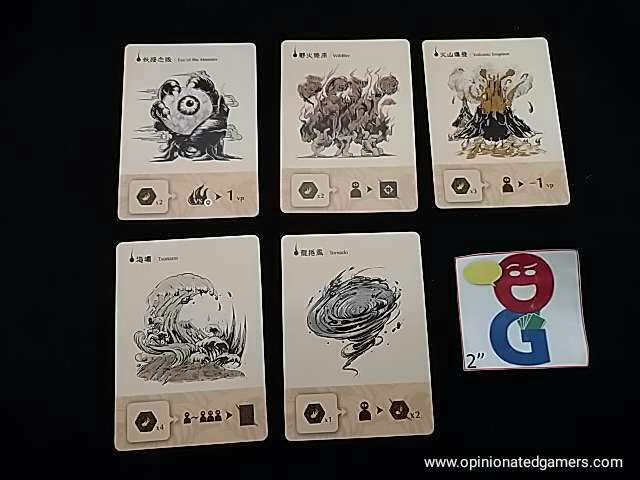 The art in the game is gorgeous if you’re a fan of the multicolored swirling Chinese style. The box art is fantastic as are the individual bits. My only complaint about the graphic production is that the numbers “1” and “2” on the dice/monster boards look too much like monsters (especially the “1”) and not enough like numbers – though once you’ve played a round or two, your brain gets used to it. With four players, the game moves along it fits and starts. When you’re active in the game – attacking or defending – you’re definitely engrossed in the game. But, if the game doesn’t come to you, it’s a lot of watching the other players brawl it out. Thankfully, the whole game should finish in about an hour, so it’s not that big of a deal. Lorna: I was only able to play shortened version of the game at the game day. Normally these kind of games are not for me but I did like it and I was interested in seeing how the game progressed as players received and used tokens on their board. We did play with an “expansion” that they said would be available as a pnp on BGG. It consisted of 4 cards for each to be played during the battle. 3 of them add to the strength during battle and the 4th had a special ability. Anyway the art is fantastic. Looking forward to receiving my copy. Dan Blum: I like the board manipulation but what you do with the board is kind of dull, particularly when there are ties, which seem fairly common. (As Dale notes the rules per se don’t say what to do when there’s a tie, but an example makes it clear that nothing happens.) It doesn’t help that the rules are unclear on some points and some spell cards that should have symbols showing when they can be played don’t, so players need to refer to the rulebook a lot. It’s short enough I’d be willing to play again, but I hope they use the board manipulation in a more compelling game someday.